Both teams were in the mood for a fight tonight, with Donte Dunn and Erik Strong wanting revenge for the brutal attack by Mutant on the night they walked in on Aldous' meditation. They felt it was an accident, and that they didn't deserve the beating they took. Tonight, it was Aldous and Mutant who took a beating for a little while, but it didn't last. Mutant is so big, and hard to move around. The 360lber used his weight and might to thrown Dunn around, and flattened him with a leg drop. Late on, he hit Erik Strong with 'The Tina Turner'; a brick wall clothesline where Strong just bounced off his mid-section! This allowed Aldous to lock Dunn in his 'Batwing', and knowing he had no hope, he tapped out. A conclusive victory for Aldous Blackfriar and Mutant, the team collectively known as 'MAYHEM'... Where do these two duos go from here...?! When Wade Orson walked out, Akima Brave's face dropped. Orson climbed into the ring and stood nose to nose with the Samoan, and then the referee rang the bell to start the match. Orson outweighs Brave, and has about a 3 inch height advantage too, and the young Brit has a ton of up-side. He showed off his power and used some hard strikes to keep Brave at bay. But Brave's form and performances have been impressive for a while now, and he wasn't about to lose quickly. He ended up dominating Orson for a long time, but couldn't put him away. In the end, with Orson down, Akima posed to the fans a little too much. Orson kipped up and hit a brutal DDT which he calls 'Bounce Back', and the match was won!! Two big, strong, men made their entrances next... 'Mighty' Danny Cavanagh and 'The Monster' Gargantuan set to go 1 on 1!! Most times they step into the ring, both of these men are bigger than their opponent are! But tonight, Danny Cavanagh was dwarfed by the massive Gargantuan standing across the ring for him! Cavanagh didn't care how big 'The Monster' was though, as he set about trying to chop the big man down. A well-placed low dropkick sent Gargantuan down to one knee, and Cavanagh was then able to hit vicious forearm shots to his face and kicks to his upper body. But when the big man caught Cavanagh's leg and stood up, it's the first time Cav has ever looked scared in NOTBPW! Gargantuan hit a brutal spinebuster, and then set the crowd into a frenzy with an elbow drop from the second rope!! It wasn't long after that that Gargantuan lifted Cavanagh up with a Military Press, and then dropped him onto his back across his knee! The 'Ultimate Backbreaker' has done for everyone it's been hit on, and Cav was no exception tonight. Andrews was asked about each of his opponents tonight in the Fatal-4-Way for the NOTBPW Television Championship... He said he respects James Hernandez, because he carries himself like a Champion 24/7... Andrews said that Sonny Wildside is perhaps the 'wild card' in the match, as an 'unknown commodity' to most wrestlers... He said the man has no fear, and therefore, nothing to lose... As for 'Shooter' Sean Deeley, Andrews has been less than impressed with him... and in particular, his fellow 'Shooters'... Who all arrived on the scene as he spoke about them!! Deeley, who knows his 'Shooters' can't interfere in tonight's match, looked threatening and aggressive towards Andrews, as if they were going to attack... But they all backed away when Andrews got some back up... from one of his opponents tonight: Sonny Wildside!! Thrill Seeker and Jacob Jett, World's Most Wanted, have been Tag Team Champions for just six weeks now, but are in their second reign as Champions. It's been over 11 years since Edd and Duane Stone had success as a tag team, winning the Ed Henson Memorial Tag Team Cup in March 2006. Tonight, 'Rock Solid' Duane Stone was used as the enforcer of the team, using his power advantage to keep Jacob Jett down. Edd Stone is a vicious little competitor, who uses stomps and kicks in flurries to keep his opponents in his corner. The Stones' ability to cut the ring in half proved invaluable, and they kept Jett isolated for long periods of time. Thrill Seeker eventually did get tagged into the match, and his explosion of pace and excitement looked like it would be enough to turn the tide. But Edd Stone delivered a vicious low blow to Jacob Jett behind the referee's back. Seeker saw it go down on the edge of the apron, and he was furious! He clambered to try and take Edd down, but Duane capitalised and delivered a hard knee to the face! Edd then tagged himself into the match, and planted Seeker with his 'Party's Over' Elbow Drop! Unbelievably, Edd and Duane Stone did it!! They're now the NOTBPW Tag Team Champions, and they couldn't be happier!! Edd was handed both of the Championship Belts, and he held them both aloft for a moment... Until Duane asked to be given one too... Edd looked reluctant, but he eventually handed one to his brother... For a couple of seconds, the two Stone Brothers soaked in the moment... But suddenly... Out of nowhere... Nobody could have seen it coming... Just like he's been doing to opponents and rivals for weeks... Edd hit a LOW BLOW on Duane!! Duane crumpled down to his knees, writhing in agony... A tear crept out of his eye as he looked up at Edd, who was stood over him now... Edd took the Championship Belt he was holding, and blasted it across his brother's face!! Despite this being very 'on brand' for Edd, the crowd couldn't believe what they were seeing...!! It was time for the NOTBPW Television Title Match next, as all four combatants made their entrances... Sonny Wildside was out first, closely followed by Sean Deeley and the 'Shooters'... Deeley told Marv Statler, Dean Waldorf and Ernest Youngman to go to the back... They're not allowed to interfere tonight... They all glared at Sonny Wildside in the ring... and they also passed Aaron Andrews on the ramp, and glared at him too... Finally, 'Mainstream' James Hernandez headed out... He looked like an absolute mega star, and he's going to take some beating tonight!! This was a chaotic brawl from start to finish. James Hernandez's Television Championship has never been in more jeopardy, and he knew he would be in for a fight against these three opponents. It was Sonny Wildside that started the brightest. He was able to take all three men down with flying kicks and springboard strikes. Nobody could handle the youngster's speed both inside and outside the ring. He hit suicide dives to the floor, and also had Sean Deeley in the 'drop zone' for his 'Fear Factor' Moonsault Stomp after just 6 minutes. Deeley moved out of the way though, and it was then his turn to dominate. Using takedowns and submission attempts, Deeley was able to show off his mat wrestling skills. He spent a lot of time trying to pin Sonny Wildside, sensing his early flurry was over, but Deeley's mistake was to not keep his attention on Aaron Andrews. For the next couple of minutes, Andrews would hit the 'Hot Shot' (Spanish Fly) on all of his opponents, and scored a number of near falls. But Deeley would take him down again and lock him in an Ankle Lock! Andrews made it to the ropes, but in a Fatal-4-Way there are NO rope breaks. He had to crawl out under the ropes! Deeley stood up, happy with his work, but as he turned around he walked onto an 'Apparition #14' from James Hernandez, and somehow, he retained his Title!! Still the NOTBPW Television Champion... James Hernandez has now held the Gold for three months... As we approach the biggest show of the year: Mid Summer Madness, Hernandez seems to have overcome all of his challengers... Sean Deeley, Sonny Wildside and Aaron Andrews looked like dangerous opponents tonight... As did Tim Westybrook and Danny Cavanagh at Super Slam... But Hernandez overcame them all... The question needs to be asked: Who's next for 'Mr. Mainstream'...?! Just four weeks away from Mid Summer Madness, where Ricky DeColt cashes in his victory in the 30-man Super Slam Battle Royale, for a shot at the NOTBPW Canadian Title. On that night, he'll have to fight all three of his brothers: Jack, Steve, and Alex, who will choose a current roster member to 'represent' him in the ring. Tonight, Ricky was in there against a dangerous man, who he could not overlook. 'The Iron Man' Tim Westybrook is a vicious, nasty, brawler, who is also the size of a bear! He's hard to manoeuvre around the ring due to his size, but also due to his strength. If he doesn't want to move, he won't. Ricky DeColt couldn't force him to get moving, and most of Ricky's offence is based on quickness and athleticism. For the longest time, Westybrook was in total control of the young DeColt Brother. However, just when Ricky looks like he's beaten, that's when he normally springs back into life and becomes more effective! He caught Westybrook off guard with an Enziguri, and then followed it up with a vicious Shining Wizard! Westybrook was stunned, and didn't know what to do. He attempted a spear in the corner but missed, and crashed shoulder first into the ring post. He then tried a stinger splash in the opposite corner, but again missed. This time he crashed head first off the top buckle! As he turned around, Ricky DeColt was waiting to hit his 'DeColt .45' Super Kick!! Westybrook didn't go down though!! He staggered back and hit the ropes. As he staggered forwards, Ricky hit ANOTHER 'DeColt .45', and this time Westybrook fell onto his back. Ricky scrambled into the cover, and got the win!! We saw a quick promo video hyping the Main Event next... The CanAm Blondes have been embroiled in a rivalry with Cameron Vessey and Christian Price for months, and it seemed to culminate at Super Slam... Where The Natural and Owen Love FINALLY defeated Vessey and Price, and got back to winning ways... But after Love angered Jack DeColt backstage last month, the two veterans went 1 on 1 for the first ever time, and Vessey and Price couldn't resist the opportunity to attack The CanAm Blondes while they were weakened... Steve DeColt came out to make the save, and it lead to a month-long build up to this six-man tag team match!! Incredible Main Event, and a match that saw all six men show exactly what they're capable of. 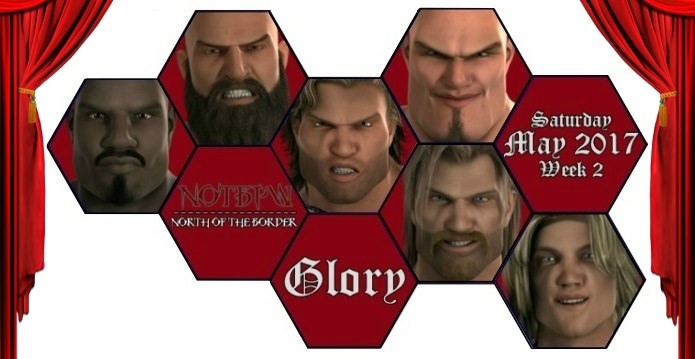 If these six were the top six in NOTBPW, then Canadian wrestling was in safe hands. But the fact is, there's another six guys just as capable currently performing in the Main Event and Upper Mid Card scene. There was no doubt that these six stole the show tonight, and all six walked away with injuries. Luckily, those injuries were minor, but all six will know they've been in a fight tonight. Owen Love spent a long time in the ring early on, with quick tags to The Natural in order to teach Cameron Vessey a lesson. However, a well placed thumb to Owen's eye caused problems for the fun-loving veteran. He was then isolated by Vessey, Christian Price, and Jack DeColt. Love tried desperately to make the tag to one of his partners, but every time he got close, one of his opponents got in the way, or delivered a cheap shot to The Natural or Steve DeColt. Despite their combined 52 years of experience, Natural and Steve fell for every evil trick in the book tonight, drawing the referee's attention a number of times. As the match wore on, things became more desperate for Owen Love. Eventually, he was able to hit a Hurricanrana on Cameron Vessey, and send him crashing into the turnbuckle! Vessey hit face first and looked out cold for a couple of seconds. He came to, and began to crawl to his corner. But so did Owen Love. Vessey was urged to turn back and try and stop Love, but it was too late. He grabbed Love's ankle as the fan favourite leapt into his corner, and tagged in Steve DeColt! The fans blew the roof off the building as 'The Outsider' stepped through the ropes slowly! He pointed at Vessey, who crawled backwards on his hands to make a tag, and in came Jack DeColt. He also stepped through the ropes slowly, and it was ON!! A brutal fight broke out between the brothers, and Jack ended up losing half a tooth! Steve's eyebrow was cut by a vicious elbow strike from Christian Price. The stiff shot caused Steve to clobber Price in the chest and send him through the ropes. The Natural had his fun too, hitting his 'Nature Calls' Piledriver on Vessey. In the end, Owen Love hit the 'Love Gun', also on Vessey, and then pinned the cocky youngster! Another win for the CanAm Blondes, and they are well and truly BACK to winning ways now... That's two wins on pay-per-view in the space of a month now for the veterans, as they look to regain momentum and work their way back to the NOTBPW Tag Team Titles... Cameron Vessey and Christian Price look like they're not finished with them though, so it'll be interesting to see how they fair in the next few months as well... As for Steve and Jack DeColt, it's onwards to Mid Summer Madness now... So far we know that Steve and Jack will be joined by their younger brother Ricky in a Fatal-4-Way Match for the NOTBPW Canadian Title... The fourth spot will be filled by a currently unnamed man... To be chosen by the fourth DeColt brother: Alex!! For more on that, and all other Mid Summer Madness news, make sure you check out Championship Wrestling this coming Wednesday!! 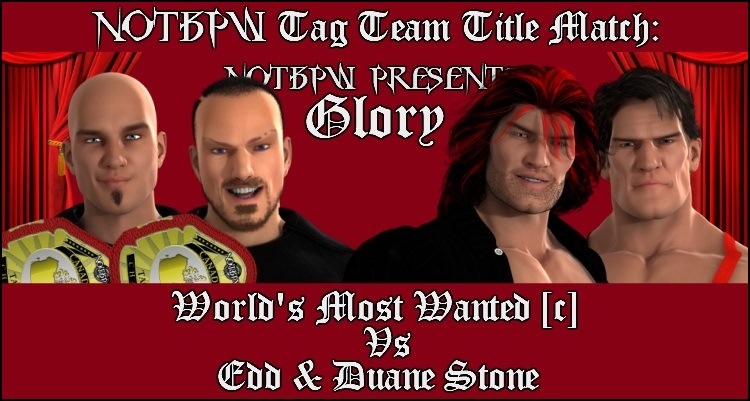 to WIN the NOTBPW Tag Team Titles!! 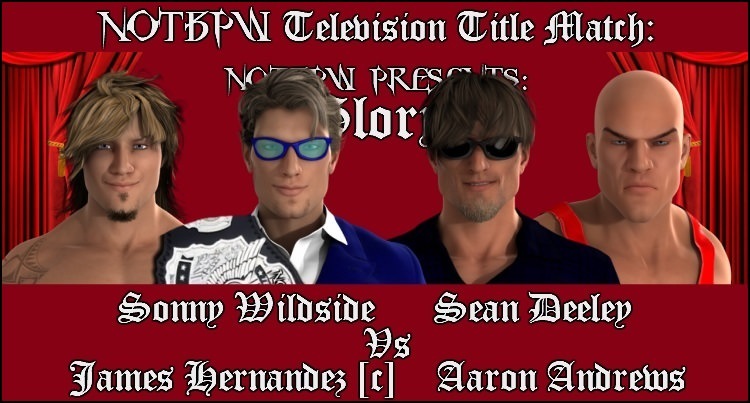 to RETAIN the NOTBPW Television Title!! 2). Will Dan DaLay, Derek Frost or Robin DaLay show up on the show? : YES!! Last edited by The Lloyd : 07-10-2018 at 03:28 AM.